About this edition: Published in 1930. A preview chapter of #6 - The Invisible Host by Gwen Bristow and Bruce Manning is included in the back of the book. About the author: Walter Livingston is also the author of The Mystery of Villa Sineste, #19 in the Mystery League series. 21 years prior to story: Robert runs off with Lady Burnleigh (Edward's wife). Cecil searches for him without success. 16 years prior to story: Edward dies by his own hand on Christmas Eve. The Manor passes to Cecil. Present: Lord Cecil arrives with Riker to plan the Manor's restoration. Hmmm... well, it's not a murder mystery. No one gets murdered. 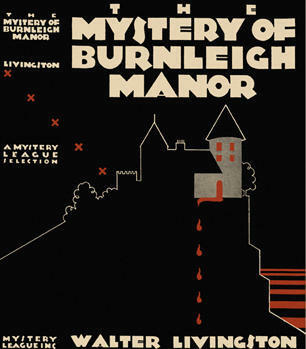 The story focuses on Burnleigh Manor, now a rundown boarded-up relic, along with the Lodge, a smaller well-kept residence at the gate on the same grounds. The Manor was the property of the eldest brother, Edward, until his death; when it passed to Cecil. The youngest brother, Robert, had run off with Edward's wife (Lady Burnleigh), both without a trace. Five years later, Edward dies by his own hand on Christmas Eve. The story begins sixteen years later. Cecil, now owner of Burnleigh Manor, contracts with an American architect, -- Riker, to examine the manor and plan for its restoration. There are reports of intruders in the boarded-up Manor, with footprints found inside and some items missing. Whatever happened to Robert and Lady Burnleigh? Who is the person (s) still accessing the Manor, and how do they do it? So what is troubling Edith, anyway? Please see this review by Bev Hankins on her blog, My Reader's Block.